US Coast Guard partners with CSK Creative to create and produce a boating safety video series. Operation Dry Water is an action by law enforcement across the country to bust drunk boaters. The operation is year-round and puts enormous amounts of law enforcement officers on duty arresting impaired boaters. CSK Creative shot and edited this PSA in Kentucky, and fun fact, it’s actually me getting the cuffs slapped on me in the thumbnail of the video. Good times. Here’s the video. 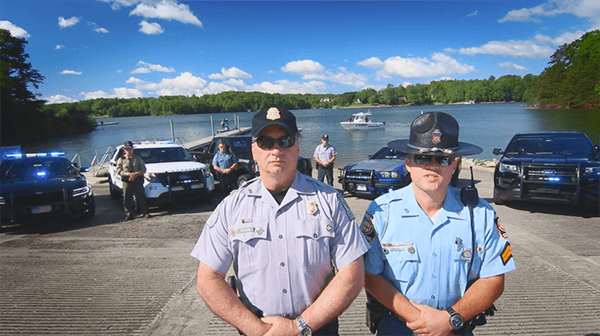 Law enforcement brought out a half dozen vehicles—boats and otherwise—to really make an impression for the last shot, so we brought out our handy eight-foot mini jib and did a crane move up for maximum effect. Under high-pressure situations like this, where everything has to be right, CSK Creative shines. We bring multiple cameras in case something happens to one of them and we need to switch over to a backup, which does happen. If your videographer is only bringing one camera to a shoot it might be time to start asking yourself what would happen if you took all the time and money to set up your shoot and his or her camera breaks. Pretty scary thought when you only have once chance to get the shot.